The first phase of the development of Gothic style was very cool because architects were experimenting with new forms without having a standard design yet. You can thus see a lot of variety in ways that builders were expanding beyond the simple 2-dimensional designs of earlier churches, and into a more dynamic world that merchants and scholars in Europe’s growing towns could relate to. A more sophisticated way of seeing the world was opening up. 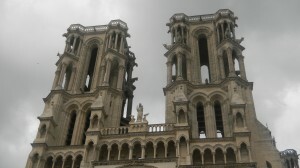 Laon presides on a 200 foot hill north of Paris. It became one of the main cloth-trading towns in northern France–it was a key link between Paris and the cloth-trading towns in Flanders. So, Laon had a large population of merchants, and they were becoming aware of themselves as a new class. 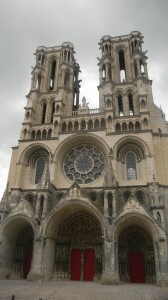 The cathedral of Laon was begun in the 1150’s, and it was built through the rest of the 12th century. 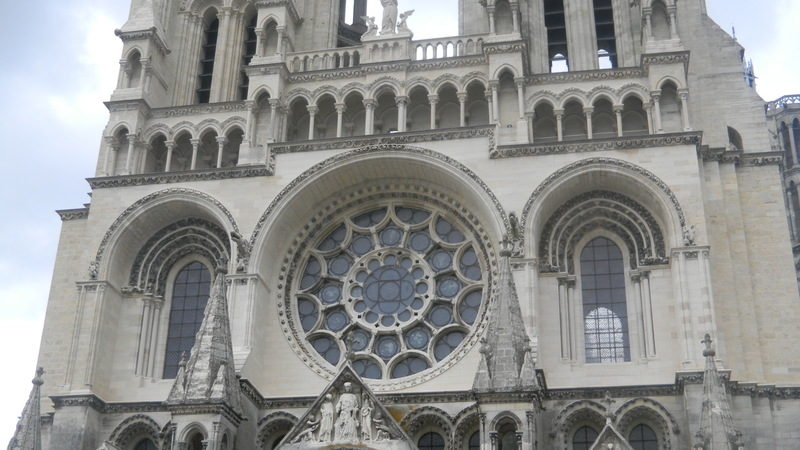 The late 12th century was Gothic style’s experimental time. The first Gothic structures, the choir and narthex of the abbey church at St. Denis, were dedicated in the early 1140’s. Chartres Cathedral later became the classic design (in the early 13th century). The cathedrals at Sens and Noyon also represent this period, But Laon Cathedral is my favorite example. The cathedral’s reflections change as you walk around the town, and as the weather changes–the sun came out by the time I took the above picture. Laon’s lofty perch winds in an S-curve as graceful as a pirouette. 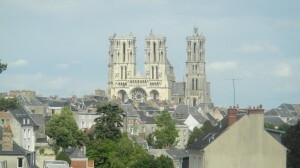 The cathedral is at one of the town’s ends. So, people in the Middle Ages saw the west facade presiding over their homes and the surrounding countryside, and changing colors all the time. Divine light shined throughout the world. 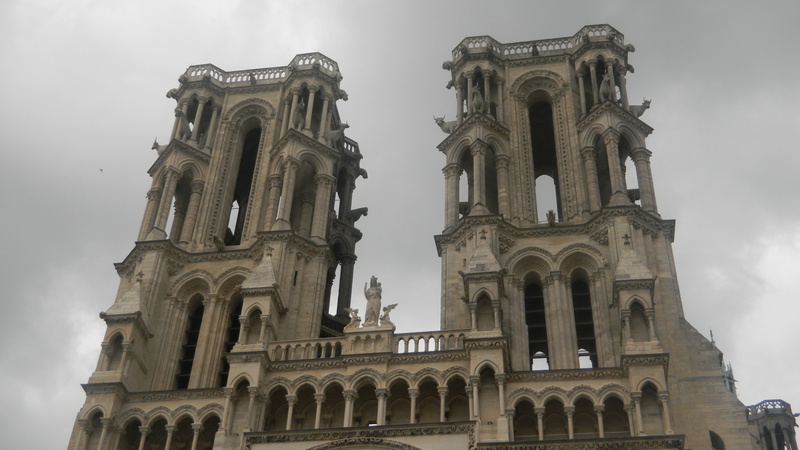 Laon Cathedral’s interior is equally magnificent. We’ll explore it in the next post.